Hey everyone! Today I want to talk about something a little more personal than my usual “Tip” blogs. Everyone has a self-image. Everyone also has an opinion about their self image. This is called your self esteem or self worth. It encompasses and intertwines with all that you do. It touches every aspect of your being and effects every decision you make. The problem is, a lot of times, our self-image is distorted. We look in the mirror and when we see ourselves, we do not see the real person standing before us. Do you point them out one by one? Or think about how you could do this or that better? Do you ever feel worse about yourself after looking in the mirror? Even if there is no mirror, do you ever just think you don’t quite measure up? Do you feel like you could have done more, when you have done all you could? I have news for you, these symptoms are a part of a very serious condition. It is not fatal, but it can be life threatening if not monitored carefully. This condition is called: Motherhood and it is associated with a general feeling of “I could do better”. The feeling that you can always do better, is one that I have always dealt with throughout my life. But that feeling never had as much weight, as when I had my baby girl. With every choice I made, I questioned myself. Wondering if I could be doing more or doing better. I’m not saying that you shouldn’t always make sure you are making the right decisions and I’m not saying that you shouldn’t want to do more and better. 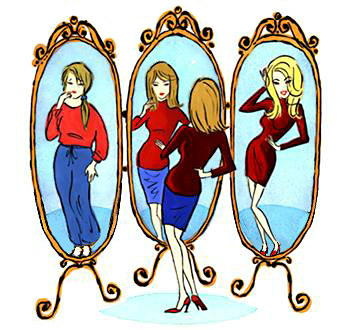 But, when it begins to weigh on your self-image, that is when it becomes a problem. An encouraging criticism of “You can do better” is perfectly acceptable, so long as your self-image and therefore your self-esteem is not affected. When self-esteem is affected, you have to take a step back and look “through the mirror” to see the person you really are inside. This tip is one I have suggested to many people over the years. It was a simple homework assignment I had during my days of therapy. For 2 weeks straight, every morning, I had to make a list of 5-10 things that I liked about myself. I had to include, at least, one physical trait and one personality trait. The rest could be anything that made me feel good about me. The first day, I struggled for about 30 minutes to come up with five. Especially that physical one! The seventh day, I could easily come up with five (including a physical one) and often had 2-3 more. By the end of the two week period, I could easily list 10 things I liked about myself every single day. Usually, I would come up with a few new ones each day, meaning I had more like 30 things I liked. It really helped me to see myself differently. I started seeing that, though there may be things I don’t like, there are far more things I do like about myself. I don’t do it everyday anymore, but when I am having a bad day, I just look at myself in the mirror and start with #1. Often times, the reason why our shortcomings seem so big is because we are already run down. When you become a Mom, you become a Hub. A hub is like the central location that is used by all. As the MomHub, it’s not only your job to manage the entire household as a whole, but to be there individually for each family member. Ask yourself, when is the last time you took a day for you? A day where you didn’t do anything for anyone else? If you’re like me, your answer is probably something like “Um… well… There was that solo grocery trip two weeks ago where I took my time picking out a new shampoo!”. Most Moms find it hard to find time and then to keep the time. But, if you don’t take time to recharge yourself, then when things get stressful, you tend to put it all on your shoulders. And, unlike when you’re refreshing yourself and recharging, you get so broken down and weak, that you can’t handle the weight. You end up letting it alter your perception of yourself. So, make sure to make time for yourself. Whether it’s 30 minutes once a day or a whole day once a week. Just take time, to relax and de-stress yourself. Make a list while you do it, lol. If you have a significant other, this is their time to shine! If you don’t, find a friend or family member and let them help you out. I once thought there was something wrong with me for wanting someone to reassure me of my value. But, as my psychiatrist, oh so long ago, explained: We need positive feedback from people we value. This allows us to strengthen our bond and to reaffirm all of the positive things you struggle to accept about yourself. It’s one thing to say to yourself you are beautiful, believe me, there is a HUGE value in being able to do that. But there’s something about hearing it from someone you love. It helps make the idea concrete. And you don’t have to necessarily ask someone to compliment you. You can always just ask someone for a hug. Or if they can just let you cry with them. Either way, just remember, the people in your life see the real you, so they can offer a real vision of your true self. I still struggle with this often. Every time I make a mistake, I tend to take it to the extreme. If I am late getting my daughter to school, suddenly I am a bad mom. If I forget to wash my husband’s work clothes, suddenly I am a bad wife. With every mistake I make, I connect it deeply to a personal flaw. Often, creating the flaw simply because of the mistake. It wasn’t until I met my current husband that I learned I needed to lighten up. Every time I would begin to freak out about some minute detail, he would just start laughing and joking about it. He wouldn’t stop joking until he had me laughing. So, I learned to adopt it. Like I said, I struggle with this one, but I work on it. Any time I start feeling like my mistake is really some great character flaw, I stop and say this: “Does ________ really make me a bad ________?” And, I start to think about how this one mistake is a drop in the ocean of who I am as a Mom/Wife/Daughter/Sister/Whatever! However much we struggle as Moms with the previous problems. I would say, no problem is more common than comparing ourselves to other women. This isn’t just a Mom problem, it’s a WOMAN problem. All our lives we compare ourselves to models, movie stars, singers, friends, family… pretty much any woman with which we come into contact. We compare our clothes, our looks, our Facebook posts, our life position, EVERYTHING! And we end up either secretly or subconsciously trying our best to out-do all of the women around us! But here’s the deal: We are all so different that really, there’s no way to compare. Everyone is a different combination of nature and nurture: genetics and raising. It is in our differences that we see the beauty within us all. I know, it sounds so cliche, but it’s true. We have to stop comparing ourselves to one another and instead, learn from each other. I hope these tips can help you see yourself as the Wild Mommy you are to everyone around you! It’s not easy changing the perception you have of yourself. But with those 5 tips, some time and some patience, you can truly begin to love and accept yourself.